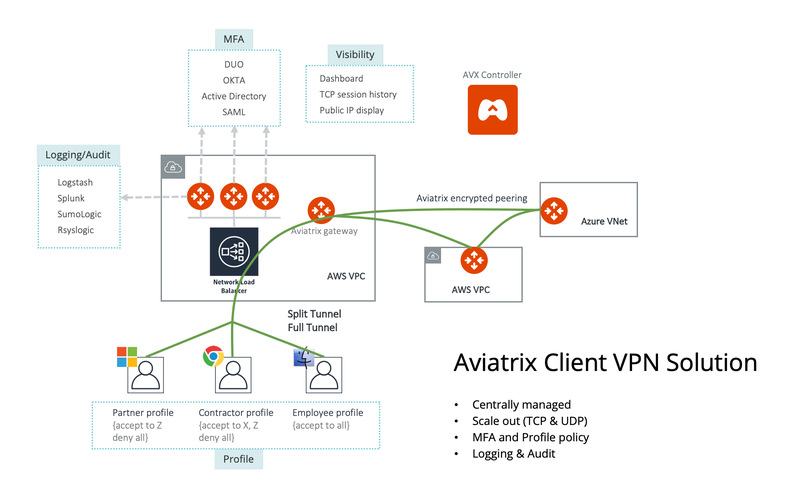 Aviatrix provides a cloud native and feature rich client VPN solution. The solution is based on OpenVPN® and is compatible with all OpenVPN® clients. In addition, Aviatrix provides its own client that supports SAML authentication directly from the client. Only AWS is drawn in the diagram, but this feature applies equally to Azure and Google Cloud. This document assumes you have set up an Aviatrix Controller. Please see this guide for more details. You can also watch a video to learn how to setup remote user VPN. The video is not up to date as the product graphics has changed, but the idea remains the same. The description in the steps below provides critical fields to get you started. You can make changes to setup advanced features such as MFA and profile based access later. 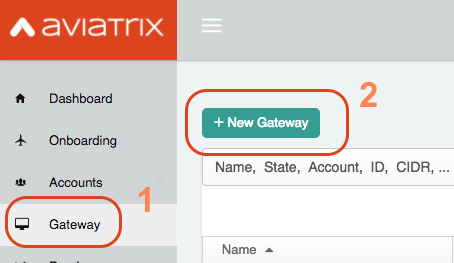 Click on the + New Gateway button at the top of the page. You will need a public subnet in the VPC where the Gateway will be provisioned. Be sure to provision a new one or identify the correct one prior to starting this step. Select the Cloud Type and enter a Gateway Name . Once the Account Name is selected, select the appropriate Region and VPC . After selecting the desired VPC ID , select the Public Subnet where the Gateway will be provisioned. Select the Gateway Size (t2.micro is sufficient for most test use cases). Select VPN Access . Leave the Advanced Options unselected. Leave the Advanced Options unselected as you can configure it later. If you wish to create more of such VPN gateways (for example, behind NLBs for load balancing), click Save Template . Click OK to create the Gateway. Once you click OK , the Gateway will be provisioned and all the configuration will be applied. This will take a minute or two. Users can be added manually or authenticated with an existing LDAP server. When a user is added to the database, an email with .ovpn file or .onc (for Chromebooks) will be sent to the user with detailed instructions. You can also download the VPN user certificate to your desktop, as shown below. Load this certificate configuration file to your OpenVPN® client on your desktop. You should be able to connect then. You now have a working Aviatrix VPN Gateway. Users can connect and gain access to their cloud resources. Detailed audit logs are maintained and available in various logging platforms.